What does this have to do with names? 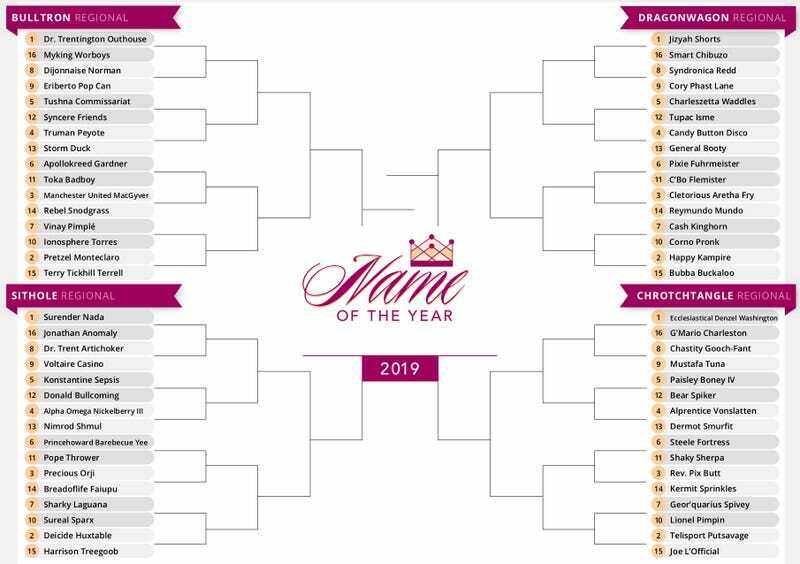 While that other bracket tries to use data to mitigate its trademark Madness, we at the Name of the Year pledge to continue to do the opposite. We will seed the NOTY Tournament field based on impulse and gut feeling. We will not develop a NOTY Evaluation Tool. Will our bias show as we whittle down our selection? You bet. Will the unpredictability inherent in the vast tapestry of human emotion cause us to miss the joy in lower-line names while overvaluing the qualities that got us hooked on our top seeds in the first place? No doubt. Will there be chaos? Almost certainly. Which brings us to a 2019 field that is strong from top to bottom. Imposing one-seeds like Texas beauty pageant contestant Jizyah Shorts and Virginia dentist Trentington Outhouse will be formidable frontrunners. But danger lurks in the middle of the bracket. There’s a Sharky Laguana in the water and a Toka Badboy patrolling the streets. And even at the bottom there are no easy matchups. Rebel Snodgrass could lead an uprising in the Bulltron Regional, or maybe 16-seed Jonathan Anomaly will be the ultimate outlier in the Sithole. Strange things have happened before. Who among our High Committee members would have thunk, when seeding the 2018 field, that 13-seed Miracle Crimes would make a run to the Sweet 16? The year before it was a 14-seed, Boats Botes, who was voted the People’s Champion. As that double-digit number implies, we didn’t see it coming. Voting will begin soon right here on Deadspin, which is hosting the whole shebang this year. And we expect the surprises to be plentiful. Across our four regions, each named after a NOTY legend, longshots will topple topliners, and the will of the people will decide which names were overvalued by our little cabal of name-loving nerds. While many will celebrate these upsets, plenty more will be, well, upset. After all, that name you found to be overseeded is likely someone else’s favorite. Ultimately, 63 rooting sections will leave our yearly enterprise disappointed, while only one will celebrate a total victory. Such is the sadness of Madness. We don’t ever want our fallibility to go away, no matter what our basketball-bracketing brethren do. Ours will be a hectic enterprise, and we will reconvene year after year wondering how it happened, what it means, and why the people never appreciated Jeffrosenberg Tan in his day. And you can take that for data. To receive updates on the 2019 Name of the Year Tournament, follow us on Twitter. We’ll be back later this week to begin round one. Sam Gutelle, in addition to names, also writes often about food and digital culture. He currently lives in Oxford, Ohio, where he attends Miami University and serves on the staff of OxMag, a grad student-run lit journal.